All started in 2006. Rapid Bucureşti was playing in the first round of the UEFA Trophy. The opponent team was Nacional Madeira from Portugal. After a 1-0 home win, thanks to a goal by Viorel Moldovan, the Romanian team had serious problems to qualify. With only a few minutes in the away game, a Brazilian midfielder, Juliano scored a free kick and gave Madeira the lead. Eventually the match went into extra time. Here Rapid scored twice and won the right to take part of the group stage. After two seasons, Jose Peseiro is put in charge of Rapid. The famous coach, that took Sporting Lisbon to the final of the UEFA Cup in 2005, came on Giuleşti with big plans. One of his first movements that he made, was the transfer of Juliano Spadacio. Yes, the player from Madeira. Original, he was more a defensive midfielder, but at the Romanian team he managed to score goal after goal. Even tough, the Portuguese coach left after a few matches, Spadacio became one of Rapids’ more important players. At the final of that season he was very close to win the best scorer title in Liga 1. He was only a goal away from this performance. How ever he scored 16 goals, including the two winning ones against Steaua Bucureşti on the Ghencea Stadium. He remains in history as the man that brought the second victory for Rapid on that pitch. Despite his great achievement, the club from Bucureşti finished 8th and so they did not grab a place in the European Cups. A year after, Spadacio became the second captain, behind Costin Lazăr, and played again very good. He scored only three league goals and one in the Romanian Cup, but still, he gave 11 assists for his team mates. Unfortunately, at the end of the season, Rapid finished 7th , and again threw away chances to take part in the continental competitions. The Brazilian became one of the most important players of the club, but the fans started to accuse him of lack of interest. They thought that his big salary doesn’t motivate him no more. But he carried on playing and he had a great start of the season. He gave several assists and scored a wonderful goal against Astra Ploieşti. More than that, he took many defensive tasks. In my memory remains the 0-0 against Steaua, when he played many minutes right back, as the player that was on that part, Candido Costa, wasn’t accustomed with the position. Juliano wasn’t either, but as team captain he had the obligation to help his team wherever he is needed. The club finished the first half of the competition on 4th place, after being in the top three ten matches. Juliano help a lot with his contribution. After two and a half years on Giuleşti he scored 21 goals and gave at least 25 goal passes. He even gave three assists in one game: in the 5-0 win against Petrolul Ploieşti in the Romanian Cup, this autumn. It looks like Spadacio is a great polyvalent player and so he is. He might have only one, big regret: not playing with Rapid many games in the European Cups. In fact he made only two appearances, in 2008 in the first round of the UEFA Cup, when he played against VfL Wolfsburg. But the teams’ this year performance, can and must ensure them a place in the next years’ continental cups. This way Spadacio will have the chance to prove his value against stronger opponents from Europe. 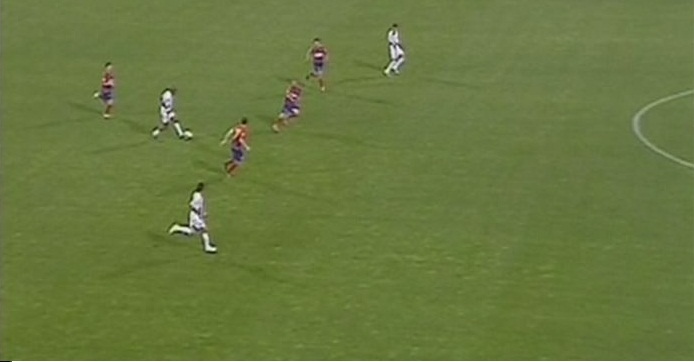 Acest articol a fost publicat în Rapid Bucureşti și etichetat 1-2, 11, 16, 2008, 21, 25, 5-0, căpitan, Jose Peseiro, Juliano Spadacio, Nacional Madeira, Rapid Bucureşti, Steaua, Wolfsburg. Pune un semn de carte cu legătura permanentă. Pai asa si Helder a fost la nationala mare a Braziliei, are chiar 1 sau 2 meciuri in care a intrat pe teren, avand in vedere ca pe postul lui mai joaca si Dani Alves sau Maicon. Culio iarasi un foarte bun fotbalist.